Ah, an Italian restaurant. I remember the first time I had dinner there. I thought it was the most romantic place - the atmosphere, the music is floats just below the soft conversations, the servers at attentive, and Mama Mia! The food is delicious! Once we ate on the patio on a cool Fall evening under the stars... I'm going to a happy place here! Each time we anticipate the arrival of a fresh baked herbed flat bread as we peruse the menu - searching for new items. We always have to ask for a second loaf and there is always swatted hands to get the last slice dipped in seasoned olive oil. It's always a toss up between the Roasted Chicken Cannelloni or the scrumptious Fettuccine Alfredo, Grilled Chicken Spiedini, or oh, I've got to stop before I beg Honey to drive me through the snow for these delicious meals. The first time we were there I begged our server to tell me what kind of bread it was and how to make it... Peasant Bread was all they would tell me and thus the quest began. After many trials, I finally found a recipe that gained my family's approval and it has quickly become a favorite on Italian night at our house, so here it is! Crispy on the outside and soft on the inside, this bread flecked with herbs, the smell just tempts you to sink your teeth into it. 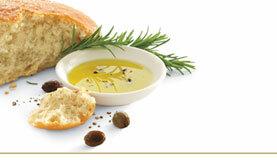 Its a great bread to tear and dip in flavored olive oils and to serve with your best Italian pasta dishes, or soups. I usually make 2 loaves at a time because it's so flavorful and it goes very quickly. BREAD MACHINE: Place ingredients, according to manufacturer's directions into your bread machine. (some call for all liquids, or all dry ingredients first, so know your machine) Set machine to"dough cycle" and wait. (This takes most machines about an hour and a half for a full cycle) Remove from machine when cycle is complete and place on a lightly greased baking sheet. I don’t have a bread machine, so this is how I do it. In a large bowl, mix the water (just a little warm to the touch) with the yeast, and let it set for 5 minutes. It should foam a little. Add the oil, salt, sugar, and rosemary; mix well. Gradually add the flour, making sure it is smooth and elastic. You might have to add just a tad bit more flour to make sure the dough is not sticky. On a well floured surface, kneed the dough until smooth and elastic. Place the dough on a baking sheet or stone. You can flatten it a bit if you want, but it should be in a round mound. This bread is not a shaped type bread, but rather takes it shape as it bakes and spreads a bit. When the dough looks like it is almost doubled in size, turn the oven on to preheat (like a mound of raised dough). Bake at 375 degrees for 20-25 minutes until crust is golden and crispy. Bread is meant to be a flatter shape and not high rising bread. I like to cut my bread and then serve with olive oil flavored with fresh ground pepper or my recipe for the Herbed Oil for Dipping Bread below. I like to mix a bunch of this up at a time and keep it in a pint jar by my spices so it will be ready any time I need it.